This 40 watt power amplifier provides the juice you need for your 25 V or 70 V PA speaker. 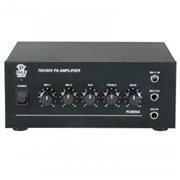 The three ¼" jack inputs are conveniently located on the front - two mic inputs and one auxillary input. Mic 1 has an auto-talkover, so you can easily cancel the other inputs. Each input has an independent gain control, and you can also adjust the tone of the sound using the rotary treble and bass faders. Connect your speakers using the rear terminals. Includes a replaceable fuse and detachable AC power input. Runs on 110 or 220 V.